You know Danny Ocean, right? George Clooney's charismatic character in the movies. It has to be one of his best roles and now there's a cocktail to commemorate it. The Danny Ocean is, quite simply, a great drink. Courtesy of Casamigos Tequila, the feature in this beverage is Casamigos Reposado, a tequila that Clooney had a hand in creating. To that, fresh citrus and agave nectar is added. The maraschino adds a nice little spark to take the cocktail from fruity highball to magical drink. If you enjoy the Paloma and are looking for a drink to shake up your tequila routine, then this is a great place to start! The tequila's not bad, either. Actually, it is one you want to add to your list. 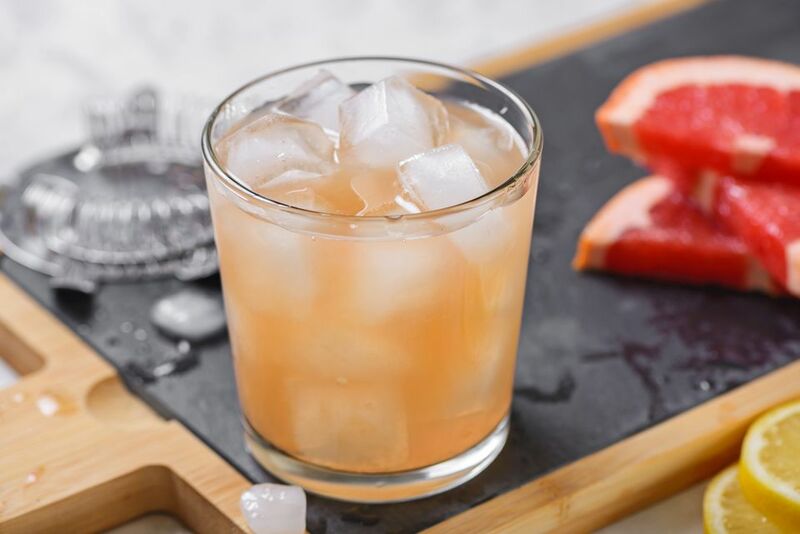 This recipe came from Casamigos Tequila and we do recommend using the drink as an introduction to this impressive tequila (more on that below). Many other premium tequilas will be just as good in the Danny Ocean, the real question may be whether a reposado tequila is necessary. We gave the drink a test, putting Casamigos Reposado against Cazadores Blanco. Both were excellent drinks as each is a great tequila from Jalisco's highlands. There was definitely an element missing with the blanco tequila, which was to be expected. That small difference which a slightly aged tequila makes is apparent and personally, we preferred the way the reposado complemented the drink's light fruits. The Danny Ocean cocktail makes another case for the 'fresh is best' argument. Bottled lemon and grapefruit juices can make a decent drink, but one made with fresh juice is notably superior. The great news? Both lemon and grapefruit are easy to juice and your don't need fancy juicers. A simple hand citrus juicer will do! Using agave nectar for any tequila cocktail is a natural choice. The two agave-based ingredients are perfect companions. Agave nectar is sweeter than most simple syrups. If you are going to substitute the nectar with another sweetener, you will likely have to adjust it. Typically you will use more simple syrup. Notice that I have simply replaced 'parts' with 'ounces' and often it is that easy. When shaken, this will produce about a 4-ounce drink, which is the perfect volume for most lowballs. How Strong Is the Danny Ocean? The tequila is chosen, so the only variable for estimating the Danny Ocean's strength is the maraschino. On average, these cherry liqueurs weigh in at about 32 percent ABV, so we'll use that for this example. In this case, this fruity drink is a relatively mild 16 percent ABV (32 proof). In comparison, this is almost half the strength of the average Margarita, so enjoy! We must preface this review with the fact that we are naturally skeptical of celebrity-backed liquor. We have seen too many times in recent years that a celebrity endorsement does little for the actual quality of spirits and quite often they are disappointments. However, we do keep an open mind when faced with any new spirit and test each on their merits, not the names behind it. In case you did not pick it up yet, Casamigos is the tequila brand that is backed by George Clooney. This story is a little different from simply tagging a celebrity face to a brand. Casamigos started out as the 'house tequila' for Clooney, Rande Gerber (Cindy Crawford's husband, restaurateur, and owner of The Whiskey NYC), and Mike Meldman (land developer and owner of Discovery Land Company). The story goes that the trio of friends love tequila and wanted to have their own tequila to enjoy at their homes in Mexico. It was first released in the U.S. market in 2013 and has since been distributed to other markets, including Canada, the UK, Bahamas and Hong Kong. Tequila production is very regulated and it is the little details that make the difference in one tequila's production versus another. Blue Weber agave is grown in the red clay soil of Jalisco, Mexico, an area known for producing the richest-tasting tequilas. Distilled at Productos Finos de Agave in Jesús María, Jalisco. Agave pinas are slow-roasted for 72 hours in brick ovens. The fermentation process takes 80 hours. Casamigos Blanco is rested for 2 months. Casamigos Reposado is aged for 7 months and Añejo is aged for 14 months, both in used American whiskey oak barrels. For all the background, the really important thing you want to know is how does this tequila stack up against others, right? We had the opportunity to taste Casamigos Reposado Tequila and try it in a few cocktails. The first impression is that it is a very nice tequila though slightly milder in flavor than some of its counterparts, but that seems to be what it's founders were going for. Casamigos was designed to be a sipping tequila, one that "didn't have to be covered up with salt or lime." On this point, they hit it on the mark! The reposado is a tequila that you can pour and sip to your heart's content. It is as smooth as a premium whiskey, has nice notes of caramel and cocoa and a silky mouthfeel and is simply a delight to drink. Everyone that we shared it with was impressed. The only problem we can foresee with Casamigos is that it may get lost in some cocktails. The Danny Ocean recipe above is probably about as complex a flavor as we would use the reposado in. If you were to go any further with strong flavors, you would lose those subtle oak qualities that make it a good tequila. Keep the drinks light and you will love mixing with Casamigos. The Verdict: Is Casamigos Worth the Money? Casamigos is on that fine line of expensive tequila. Compared to many of its counterparts, the brand did do an excellent job of keeping it below the $50 price point (except the añejo) that can be a deterrent for many drinkers. It's the magic number for the majority of us because once liquor passes it, it becomes a real luxury. We do think that Casamigos is worth the money. It is a nice tequila that is premium but not overpriced for what it is. It's a tequila that you can save for those special occasions without feeling like you're either wasting it in a mixed drink or sacrificing your hard earned dollars. Though we've only tasted one of the three Casamigos Tequilas, we suspect that the blanco and añejo follow suit with the reposado. Is this going to be a tequila for those who love the bold agave flavors? No. This is a tequila for drinkers who enjoy the softer side and it is a gentle introduction for the new tequila aficionado.